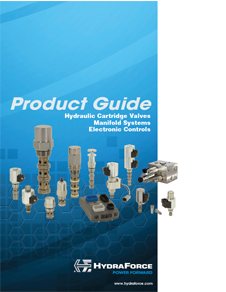 Our Product Guide is a 28-page four-color listing of HydraForce standard products, including solenoid and electroproportional valves, directional valves, flow control valves, pressure control valves, plus specialty products like the new G3 transmission, pilot and powertrain valves, and space-saving multi-function valves. The Guide also includes a complete listing of electronic controllers for proportional valves, pressure and temperature sensors, and operator displays and control panels. Valves are listed by model number with function descriptions, ISO graphic symbols, pressure and flow ratings. The Guide also provides general background on HydraForce, plus a list of manufacturing locations and contact information.